Opponents of a controversial development in Carmel Valley collected enough referendum petition signatures to force the San Diego City Council to either rescind its approval of the project or put the issue to voters, the City Clerk’s Office announced Friday. More than 60,000 signatures were turned in by opponents of the 23.6-acre project, far more than the 34,000-plus needed to qualify. However, the City Clerk’s Office also received nearly 29,500 requests from people asking that their names be taken off the petitions. The $750 million One Paseo proposal, from Kilroy Realty, calls for 10 buildings encompassing nearly 1.5 million square feet of floor space, including shops, offices, a movie theater and more than 600 housing units south of Del Mar Heights Road, between El Camino Real and High Bluff Drive. It was approved on a pair of City Council votes earlier this year, by margins of 7-2 and 6-1. The statement referred to Donahue Schriber, the owner of Del Mar Highlands Town Center across the street from the empty lot eyed by Kilroy. Donahue Schriber and three community groups — Alliance for Responsible Development, the East Bluff Community Association, and Mitigate One Paseo — have filed a pair of lawsuits seeking to stop One Paseo from being built. 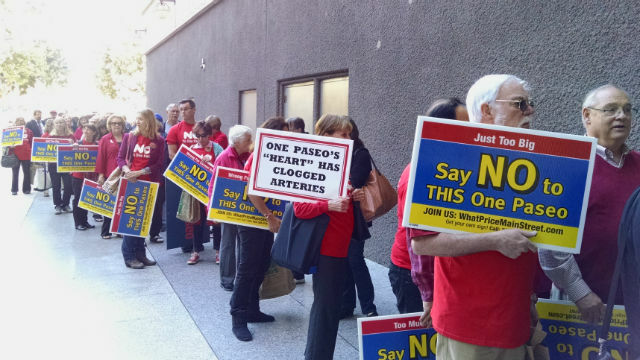 A group called Protect San Diego’s Neighborhoods, which led the petition drive, issued a statement that said elected officials have to be held accountable for their decisions. Among the opponents was council President Sherri Lightner, who represents the area. According to the opponents, such a dense development will bring even more traffic to an already congested area, and goes against the community’s zoning plan. Supporters say high-tech traffic signals will relieve congestion, and that the so-called “urban infill” project is the wave of the future for San Diego development. City Clerk Elizabeth Maland said she will officially inform the City Council of the petition results on May 11. The council would be scheduled to take action one week later. Jeff Powers, a spokesman for Protect San Diego’s Neighborhoods, said he hopes that if the council opts for a public vote, it would be scheduled for the June 2016 ballot — not an earlier special election, which the group claimed would be funded by Kilroy.